Two samples of flaxseed, Linott and a mixture of several varieties, were milled and stored at 23±2°C for 128 d in paper bags with plastic liners. Samples were evaluated at 0, 33, 66, 96, and 128 d for chemical, sensory, and volatile indicators of quality. Neither the mixed variety nor Linott samples showed a significant increase in peroxide values or conjugated double bonds throughout the 128-d storage period. Only the Linott sample showed a significant increase in free fatty acids, which was likely due to the presence of immature seed in the sample. Total volatiles increased with storage in the mixed variety sample but showed minimal change in the Linott sample. Overall, the levels of total volatiles in the milled flaxseed samples were much lower than levels reported in stored vegetable oils containing significantly lower levels of linolenic acid. 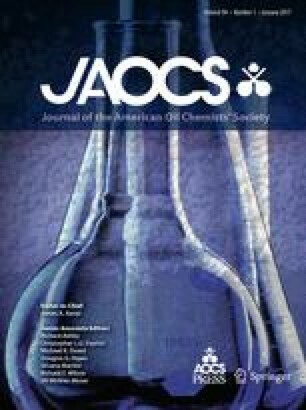 Dienals, formed during polyunsaturated fatty acid oxidation, and hexanal, a compound used as an indicator of oxidative deterioration, were found at very low levels in both samples and did not reach high levels throughout the 128-d storage period. A trained sensory panel could not detect any differences in the odor properties of fresh or stored milled samples. No differences in flavor could be detected between bread made with 0- and 128-d milled flaxseed. This study showed that milled flaxseed can be stored up to 4 mon at ambient temperatures without noticeable changes in quality. The presence of endogenous antioxidants in the milled flaxseed may account for the stability observed.